Once again, it's Baseball Bloggers Alliance award season! It's a lot like the BBWAA award season with different names because they get litigious with their free time. The fine staff here at Off Base will guide you through our ballots over the next few days. Now up, the AL Stan Musial or how Mike Trout learned to stop running and love hitting bombs. And here we are again. 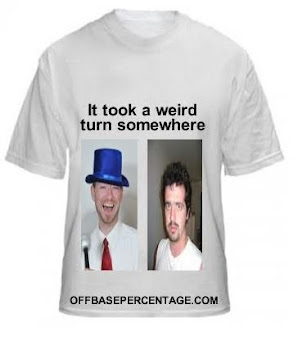 I've been a member of the Baseball Bloggers Alliance since 2010. Back then I used to have to telefax blog posts from the computer lab at the university. I had to walk eight miles, uphill, in the snow to get there. They were simpler times. The BBA has come a long way since it was founded in 2009. It has over 200 blogs voting on these regular season awards. And I feel confident that for the third consecutive year, the BBA will do what the BBWAA has not been able to do just yet. And that's give Mike Trout another first place finish for being the most valuable baseball player on the planet. This comes as no surprise. When given the option of voting for Trout, much like being offered Carvel ice cream cake, a reasonable person always jumps at the opportunity. Trout led all of baseball again in Fangraphs Wins Above Replacement. But unlike previous seasons, I can't yammer on about Trout putting up the greatest season ever for his particular age, in this case his 22-year-old baseball year. His 7.8 fWAR was the worst of his three year career and the first time he dipped below the 10 WAR mark. He made some interesting adjustments in his third full season. Adjustments that hurt him in advanced metrics but will help him win his first BBWAA AL MVP. He struck out a ton. After hanging around a 19-22% strikeout rate, he jumped to 26.1% and finished Sept/Oct with a 32% rate. That said, if you tried to pitch Mike down, like most pitchers are want to do, he destroyed baseballs. Trout set a career high with 36 homers and 111 RBI. And maybe more importantly, the Angels had the best record in baseball making Trout an almost slam dunk for AL MVP. He did stop running. Only 16 stolen bases compared to 33 last year and 49 in 2012. His AVG fell to .287 after .323 in 2013 and .326 in 2012. The .377 OBP was a career low too after hanging around .400 the previous years. And some of that can be explained by a 27 point drop in BABIP. Also, we're just picking nits here. Nobody is really questioning that Trout is the best in baseball. But now there's a legit scouting report on him and it will be interesting to see how he adjusts next year. 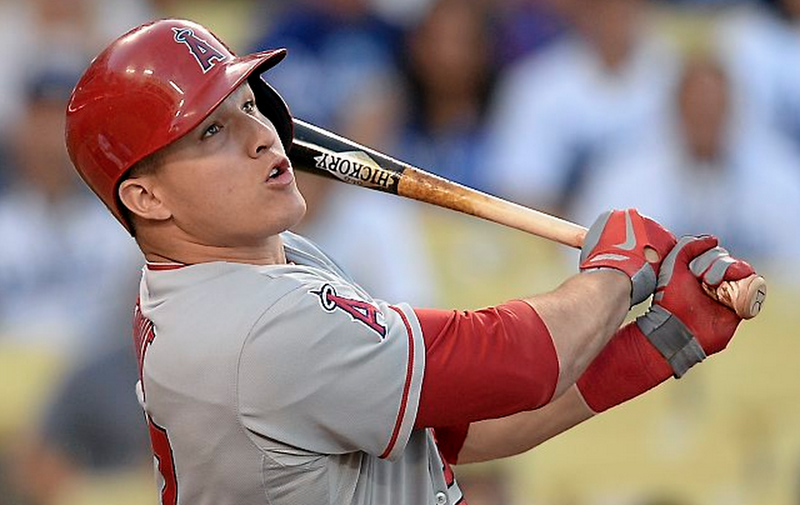 The question about Trout's MVP candidacy will mainly be whether or not he's unanimous. He won't be in the BBWAA because regional writers were dying to make a case for anybody else so Josh Donaldson and Victor Martinez are bound to steal a few votes. I feel slightly more confident in my BBA brethren. Brantley has been a solid Major Leaguer for the Indians since 2011. And then in his 26-year-old season, everything came together. Twenty home runs, 23 stolen bases, a .327/.385/.506 line. He was Mike Trout lite in 2014. That's certainly good enough for second. Everybody raise your hand if you had Corey Kluber and Michael Brantley finishing in the top two for AL Cy and MVP. Everybody with their hand up is a dirty, dirty liar. Joey Bats continues to be super productive and flies under the radar. Is it because he doesn't hit for a high average? Is it because he's Canadian? I assume players have to convert if they play for Toronto. Maybe we'll never know but Bautista is a beast. This begins the portion of the ballot where offense gets the nod over defense. My apologies to Alex Gordon and Josh Donaldson. Four players had a wRC+ (adjusted Weighted Runs Created) over 160 this season. Andrew McCutchen 168, Trout 167, Martinez 166 and Jose Abreu 165. Now, Martinez and Abreu contributed little to negative a lot on the defensive side of the game but you do have to score to win. Martinez hit .335/.409/.565 and I have a weakness for players that reach base over 40% of the time. .317/.383/.581 with 36 home runs and can fake first base. I have fantasies about the Cuban defector only signing a one-year deal with the white Sox and being a free agent this winter. What would the bidding look like? I imagine it would be enough to put a nice bid on Cuba when it eventually forecloses. What can I say? Elite outfield defense and a .266/.351/.432 line. He might not be the superstar prospect the Royals thought they had but this ain't bad either. He was the best pitcher in the AL. By a super thin margin. He was debatably the best pitcher in the AL. Is everybody on board yet? Honestly, do you realize that Beltre is going to the Hall of Fame? He's at 70.8 fWAR. He's the most dependable superstar that few realize is a superstar. I plan on him inviting me to his induction ceremony since I've been on this bandwagon for quite some time. Or Kyle Seager. But Seager called tails. The former Marlins prospect was supposed to have the glove for third base but the bat was questionable. Unfortunately, the glove didn't live up to its billing and the .215/.256.330 line more than lived up to the questionable bat part of the equation. His -1.7 fWAR tied NL LVP Dominic Brown's mark for "ugh."